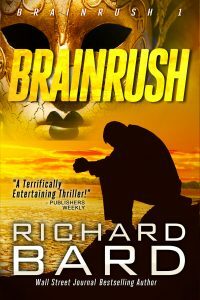 Publishers Weekly heralded this first book in Richard Bard’s Brainrush thriller series as “terrifically entertaining” and “inventive and compelling.” It went on to earn The Wall Street Journal’s #1 Action/Adventure slot in their Guide to Self-Published Big Sellers. An ocean away, Luciano Battista wants a piece of Jake’s talent. Posing as a pioneering scientist, the terrorist leader has been conducting cerebral-implant experiments in a sinister quest to create a breed of super jihadist agents…and Jake’s altered brain may be the key to his success. But Jake refuses to play the pawn in an unholy war–and when an innocent woman and autistic child are taken hostage to force his cooperation, he embarks on a jihad of his own. Jake and his band of loyal friends are thrust into a deadly chase that leads from the canals of Venice through Monte Carlo and finally to an ancient cavern in the Hindu Kush mountains of Afghanistan–where Jake discovers that his newfound talents carry a hidden price that threatens the entire human race.